Mother’s Day afternoon was spent just how I wanted it: out at a gorgeous farm, with good food, family and friends. 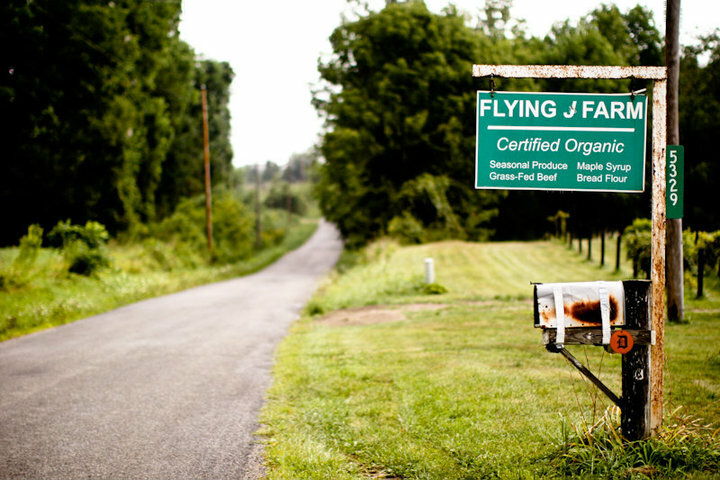 Pleasantview Farm is twenty miles outside of Columbus, but feels a world away. The farm is quiet with vast expanses of meadow and sky. A working organic dairy farm, it is home to a great many head of beautiful dairy cows and their adorable offspring. 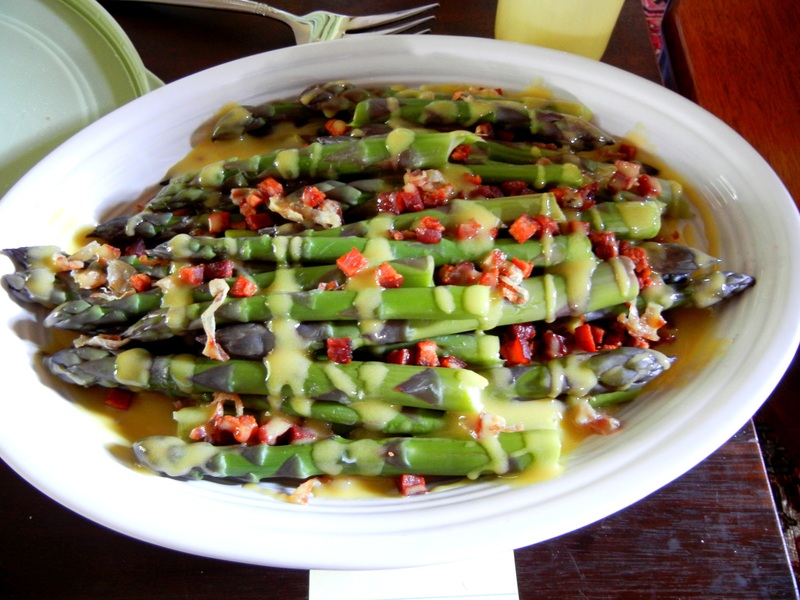 Since it was a potluck, I brought along an easy asparagus salad that was drizzled with a mustard dressing just before serving (a Ball jar works great for this). It was an easy, no fuss day. Perfect for Mother’s Day. A little kitchen magic. After 24 hours, thick creme fraiche pours from the heavy cream container. But not only did I learn the difference between sweet cream and cultured cream butters (and made them) but I also learned something tremendous: how to make crème fraiche. Oh yes. Mix the two. 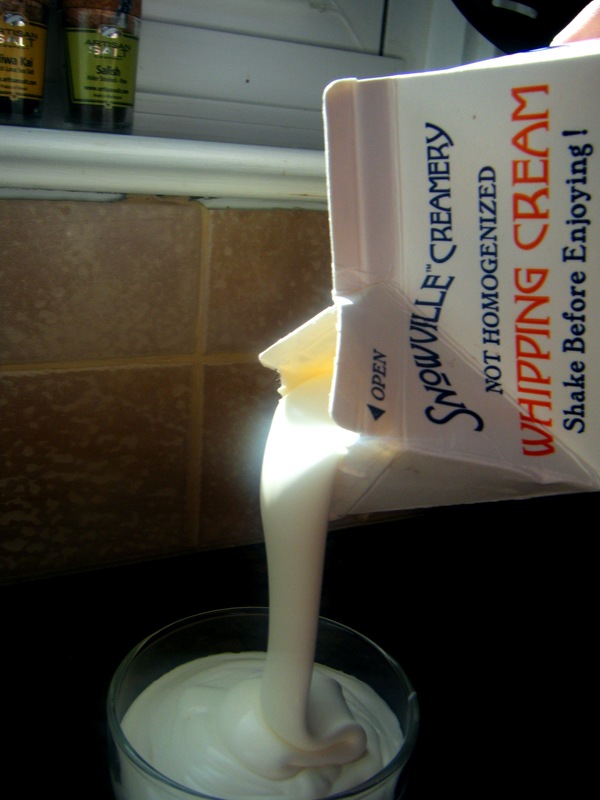 In Snowville’s carton, there’s enough room for you to add in the buttermilk and shake it to mix. Let it sit on the counter for 24 hours. Voilà ! Crème fraiche. Refrigerate until ready to use. Then to make cultured butter, pour some of this crème fraiche into a food processor (no higher than the liquid fill line) and flip on. Process until the butter separates from the buttermilk (it will happen rather suddenly). Using your hands squeeze out all the buttermilk from the butter (do this over a bowl and save that buttermilk for pancakes or coleslaw dressing), then rinse the butter under cold water until it runs clear (it keeps longer if you do this). Fun fact: If you make butter from heavy cream, the liquid you press out is not buttermilk, it’s skim milk! Who knew? Keep an eye out for crème fraiche in tonight’s dinner. It’s divine. Thank you Warren Taylor. We love Snowville. We love your pasture grazed cows. We love their fresh milk and the heavenly cream that rises to the top. Ladies getting a treat of some corn silage (grown on the premises) and alfalfa. This morning we drove out to Oakvale Farmstead for their holiday open house. We were greeted exuberantly by Greta, a golden lab farm dog. I could tell, it was going to be a delightful morning. Instantly, Cherub was off and running, enticing Greta to follow her around, which she did without hesitation. Oakvale ships wheels all over the world. I met with Dena King-Nossokoff to talk cheese and learn a bit more about how they make their gouda. The farm is family owned and run. The King family has a herd of about 20 beautiful and happy dairy cows that provide the milk for their very famous Gouda. 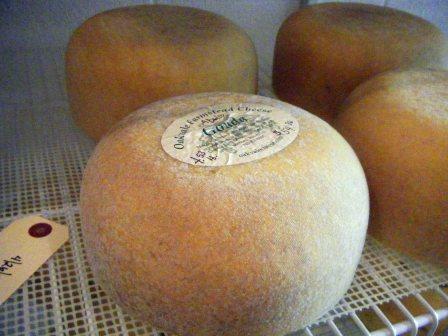 Farmstead cheese, by definition, is made on the farm with only the milk of the dairy animals that live there. In their cheese house, you can take a look at the cheese-making room as well as choose from many varieties of cheese including gouda rubbed with Barley’s Russian stout. 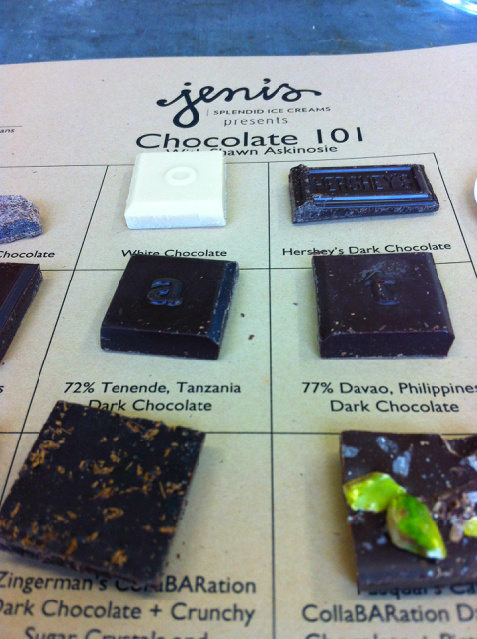 We took home a chunk of that, as well as some caraway seed gouda that I’ll use for dinner tonight. 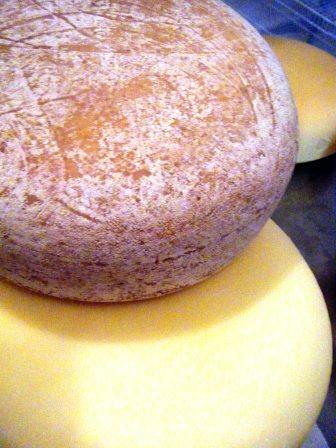 Aged gouda at the top has a decidedly different look than the young gouda (bottom). Hades, Cherub and I headed to Johnstown this afternoon for some fun on the farm. Cherub enjoys chasing the chickens and enticing Jewel the farm dog to play fetch. Hades and I were looking forward to the organic, grass-fed beef burgers for which Farmer Jensen is famous. While once again it managed to rain when we were there (same as the Slow Food dinner back August), but the rain never seems to dampen anyone’s spirits when they’re there. 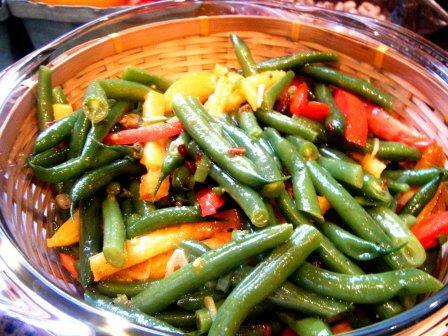 Dinner was pot luck, so I brought along a green bean and tomato salad from all the produce loveliness we bought this morning. Original credit for this salad goes to Chef Brian Polcyn, cited in Ruhlman’s Soul of a Chef. This is an easy salad that is great for entertaining and for pot luck meals like this one. And it could hardly be more local. In a large pot of heavily salted boiling water, cook the beans for 3 to 4 minutes, or until just done. Remove the beans from the water to a bowl of ice water to stop the cooking. Render the chopped bacon ends until crispy. Remove to a plate lined with a paper towel. Reserve the drippings. Yes. Do it. In a large bowl, combine the bacon fat, 1/8 c grapeseed oil, 1/8 apple cider vinegar and the salt and pepper. Whisk to combine. Add the beans (that have been drained and dried slightly), yellow and red tomatoes, green onion, and crispy bacon. Mix lightly to keep the tomatoes in strips. For more pictures of Slow Foods Columbus‘s Shake the Hand That Feeds You Dinner, check the Ely Brothers’ Facebook album. I figured it’d be best to set some ground rules for the next week of cooking, eating and imbibing. I’ve looked up the definition of local food, and have been presented with a number of conflicting definitions. But this week’s theme from Local Matters is OH So Good. And many people are comfortable saying anything within two-hour drive can be considered local. Fortunately, we live right smack in the middle of Ohio. We’ll go with that two-hour rule. But I am going give up the Coke Zeros. I’m pretty sure they aren’t locally harvested. 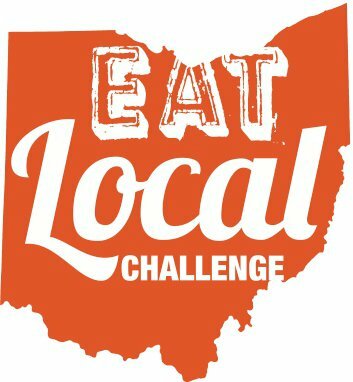 I’ll also occasionally feature Ohio-produced goods this week, like Rossi Pasta or Silver Bridge Coffee, although neither source locally. In general, I’ll do my best to make sure it’s from as close to home as possible. All this week, too, in keeping with our theme, I’ll be featuring some of my favorite Ohio music. The goal of the week is to have some fun, try some new dishes, meet some new farmers and eat some great food. Thanks for following me on the journey!